Super star shaped blooms of white Oriental lilies and blue Agapanthus are enhanced by deep blue Eryngium thistles and spikes of blue delphiniums in this midsummer mixture. 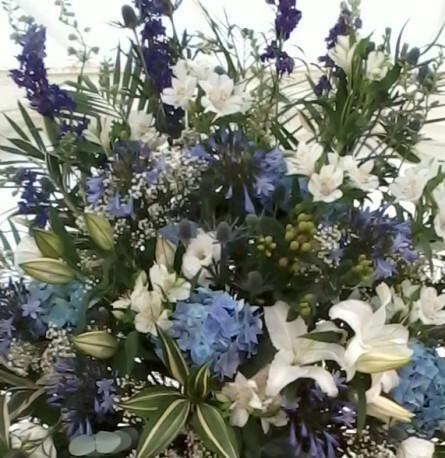 The whole mixture envokes an air of blue and white clouds with wisps of Gypsophila and the stunning blue of Hydrangeas. White Alstromeria with little bursts of green Hypericum berries add texture and the foliages add another layer of interest. The lattice of palm fronds and stripes of draceana leaves mingle with curves of grey blue Eucalyptus leaves. This picture is of a large display piece but it does give you the chance to see how all these flowers work together to give a light airy effect. Blue is a recessive colour (it hides away) so you need lots of it to make an impact but if you want to give a gift with a peaceful, calming and tranquil air this mixture achieves it. Ideal for keen flower arrangers it can be supplied as a flat packed bouquet, or as a Hand-tied gift bouquet. If you would like us to aqua-pack it for your recipient just let us know, we can do that too. Ths standard price is for a simple flat packed mix or basic Hand-tied bouquet.